My blog has really suffered lately! SORRY! As you can imagine, I am pretty physically and mentally exhausted. My new job is working me pretty hard, but its nothing I can't handle! I just feel like I haven't rested in weeks. Last week on my days off I spent one whole day visiting all of my doctors, and the other scrapping all day! Not that I'm complaining! Just tired. This week I have the weekend off, but I'm still not getting any rest! Today I cleaned for a bit, did some laundry, and by 10am I had acquired 2 extra kids and found myself at Walmart which is pretty hectic the day before a holiday! 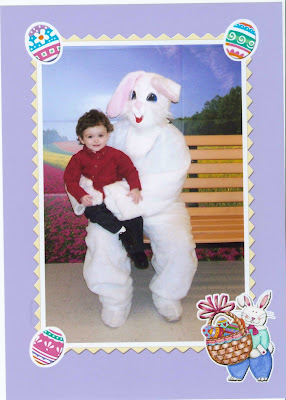 So we met the Easter Bunny-whom Aaron loved! If you talked to me at Christmas you know that he hated Santa, but he threw a fit when I tried to make him leave the Easter Bunny! He wrapped his arms around him and said "NO, MINE!". It was so cute. I love that kid. Look how adorable he is! After that we went to my church egg hunt, which was pretty insane! There were only about 20-25 kids there, and they "hid" over 2700 eggs! 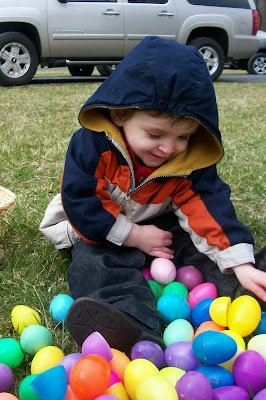 This was Aaron's first egg hunt! He had so much fun. So did my baby brother David and my niece Lexy. They both got about 150 eggs each! Picking Aaron up and down and up and down and having him ram me in the stomach with his knees for an hour wasn't much fun though...Now he is finally napping and I'm down to one extra kid who is in a really nasty mood. Anyone know of a good vacation spot?! And please don't think I'm complaining-I LOVE my life! I'm just so very tired!! Anyways, here is a pic of my little man hoarding his eggs! Well, as I said before I spent one day last week scrapping with my HappyScrappers buddies! I had so much fun and it was so nice to be out of the house (but not at work)! I had the best time and it was much needed. I completed 4 pages, plus I did 2 more that are 90% finished. Not bad, huh?! Here are 2 pages I finished. 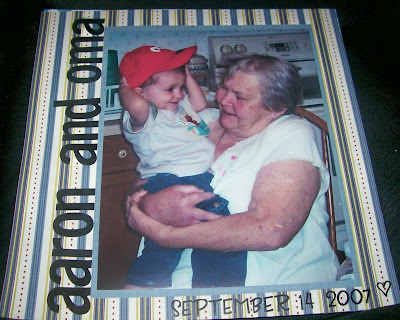 This first one is a picture of Aaron and my husband's grandmother. She hasn't been in the greatest health lately, so I really want to cherish the few pictures that we have of the two of them together! I believe the paper is Chatterbox, the small letters are TLC, and I can't think of what the big ones are! Very simple, but I like it! This next photo was taken right after we moved into our new house. Aaron LOVED his new room and played so hard, he fell asleep on the floor! These papers are Quick Quotes-the collection is called Aron! 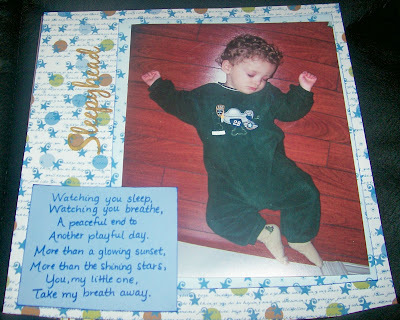 :) The Sleepyhead is a Karen Foster Rub on, and the poem is something I found online! 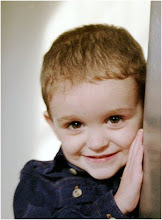 That is one cute kid! One of my very favorite blogging buddies, Carol, is having blog candy for her birthday, (HAPPY BIRTHDAY CAROL!) 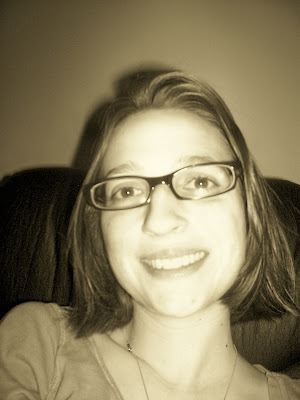 and one of the rules is you have to post a current pic of yourself on your blog. Ughh. I hate pictures of me, especially when I'm pregnant and feel yucky! Anyways, here's my photo Carol! Not the best, but as I said, its been a long day and I feel pretty crappy! But here I am world! Well, that's about it for now. Sorry to have written so much, guess I just needed to write to get some things off my mind! :) Hope you all have a wonderfully blessed Easter! I'll be starting with church at 7am and probably won't be home until 7pm! Another long day, but it looks to be a great one! Thanks for stopping in!